Up to 140 people are feared dead after a boat carrying passengers and goods capsized on a river in the Democratic Republic of Congo, officials say. 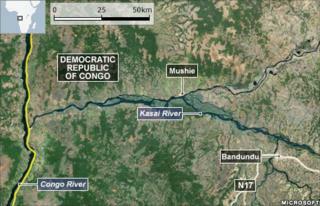 The accident happened on the Kasai river - a tributary of the Congo River - in the western province of Bandundu. Information Minister Lambert Mende told the BBC the vessel had been overloaded and 80 people had been confirmed dead. After decades of conflict, DR Congo has few roads or rail links and many people travel on often overloaded boats. The latest accident occurred on Wednesday. Mr Mende told the BBC the river level had been low and the accident occurred when the overcrowded boat hit a mud bank. He told the AFP news agency that 76 survivors had been found and that the ferry had officially been carrying 180 passengers. But he said many more people are likely to have boarded the boat illegally. Several local officials have said about 140 people are believed to have died. The ferry was travelling to the capital Kinshasa from Mushie, about 30km (20 miles) from the town of Bandundu, AFP reports. Last November at least 73 people died when a boat sank on Lake Mai-Ndombe, also in Bandundu province. DR Congo - a country the size of western Europe - has only a few hundred kilometres of paved roads outside the cities, so the rivers are the main long-distance transport link for the majority of people who cannot afford to travel by air.